I’ve been watching my little bit of retirement fund as it is affected by the economic winds shaking the stock market and thinking dark thoughts about economic apocalypse. Or at least about a depression. I’ve been thinking a lot about rain barrels and gardens and having two bedrooms and how I could take in a couple of boarders. Not really seriously (although I do plan to garden next spring since I’m not going to be traveling as much as I have been.) This is the only explanation I have for why, when I was at the grocery and saw Sugar Pie pumpkins I bought one with plans to make a pumpkin pie. Pumpkin is a pretty weird thing to put in a dessert. Not that pumpkin isn’t, botanically speaking, a fruit. But so are tomatoes, green peppers, and cucumbers and we don’t make dessert pies out of cucumbers. Pumpkin pie is a triumph of sugar over vegetableness. (There are tomato desserts—tomato sorbets, tomato pies. They are also, obviously, a triumph of sugar, this time over acid.) Pumpkin is a squash, like Acorn or Hubbard. It’s pretty good as a vegetable, and it makes a killer soup. In fact the stuff in the can, labeled pumpkin, is actually not pumpkin but a different squash, one that is actually more pumpkin colored than actual cooked pumpkin. But it tastes just like pumpkin and also makes great soup. The pumpkin sat, picturesquely, in my kitchen for a couple of days, while I contemplated the folly of what I had done. Maybe it really wasn’t my depression fantasies/anxieties. Maybe it was instead a snobbish obsession with preparing foods ‘from scratch.’ A disdain for ‘processed’ foods. ‘From scratch’ is always better, right? ‘Processed’ is bad. Unless the process is making cheese, or wine. Or even sugar. Give me sugar beets and tell me to make sugar and I’m pretty much up a creek. Well, here I was, about to process a pumpkin. It certainly looked cool, there on the counter, in its unmistakable pumpkiness. Eventually the pumpkin shamed me and I roasted it. The options were pretty much roasted or steamed or boiled, and one of the many advantages of canned pumpkin is that it has a lot less water in it than fresh pumpkin. Roasting, I thought, would deepen and caramelize the flavor a little and would reduce liquid rather than add it. I wouldn’t be making pumpkin pie, I’d be making ‘roasted pumpkin pie.’ ‘Roasted pumpkin pie’ had to be better. On a menu in a restaurant, I might order pumpkin pie. But I would certainly be impressed by Roasted Pumpkin Pie. Besides, I tried peeling a pumpkin once and it was very very hard. I cut the pumpkin in half, cleaned out the seeds, and baked it in the oven on 350 degrees for about forty minutes (maybe longer) until it was soft and the edges had started to brown. Then I took it out of the oven and let it cool, glaring at the Golden Retriever who is currently on prednisone and has an appetite that drives him to counter surf. He wandered around the kitchen, lifting his nose to counter level when he thought I wasn’t looking. 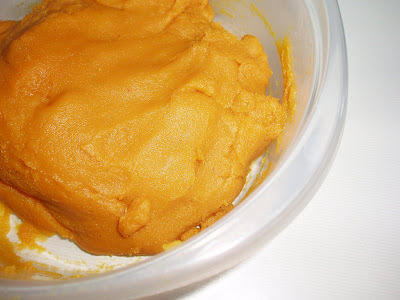 I scooped out the pumpkin flesh and plunked it in the food processor and pureed the stuff.It took a surprisingly long time.And there was quite a bit of it. Maybe two pumpkin pie’s worth? Hard to tell, because I don’t usually measure pumpkin. I open the can and plop the whole contents in a bowl with beaten eggs. I made sure that it was out of reach of the dogs and wandered off to read about using fresh pumpkin. There was a surprising amount of material on how to get the water out. You can kind of simmer the stuff for awhile. Or you could take the glob, wrap it in cheesecloth and let it drain, the way you make soft cheese. (Which, come to think of it, might be why it’s called ‘cheese cloth.’) Of course the stuff that drains out of it is pumpkin juice and you are draining away some flavor. I did a little of both. I cooked the stuff for awhile, but I was eventually afraid of burning it and by this time I had sunk enough time and effort into this damn stuff that thought of ruining it was intolerable. I wrapped it in cheesecloth, squeezed liquid out of it (into a bowl) and then let it sit and drain awhile. I took all the squeezed out pumpkin juice and stirred it into the dog’s food. I happen to know that dogs like pumpkin. One of the things you can do with an overweight dog is replace a third of his food measure for measure with canned pumpkin. Pumpkin is a vegetable, remember? Low in calories, high in fiber. And it’s got a ton of beta carotene, so it’s probably good for their night vision or something. They don’t care, they just really like it. The dog liked the pumpkin juice, too. I finally stuck the pumpkin puree in the fridge and put off making pumpkin pie until the next day. The next day I made the pumpkin pie. I have a kitchen scale so I pulled a can of pumpkin out of the pantry (I am not kidding, I bought a pumpkin when I already had canned pumpkin in the pantry) and found out that a can of pumpkin is 15 oz. So I measured out 15 oz of my pumpkin puree, which was quite pretty in a baby food sort of way. There was a lot more left. I replaced a third of the dog's food with homemade pumpkin puree. He liked it fine. Of course, he eats sticks in the back yard. I made the pie pretty much according to the directions on the can except—having read a couple of articles on making a better pumpkin pie (all right, cheating, but I had invested a great deal of time in this thing and I thought I should pull out all the stops)—I replaced a fourth of a cup of the sugar with a fourth of a cup of real maple syrup. It was a little paler than pumpkin pie usually is. It was a good pumpkin pie. It was a pretentious pumpkin pie. The maple syrup was a great tip. It came out light and custardy. But it was hardly a great pumpkin pie. 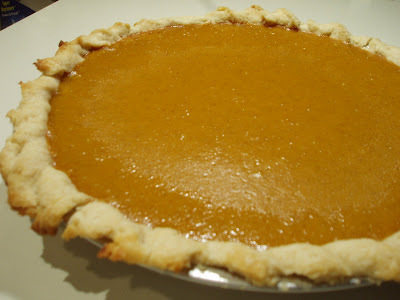 In fact, other than the maple syrup, it was probably like a lot of other perfectly good pumpkin pies I have made before. But hey, it’s nice to know that if the economy goes to hell and we are forced to live off of a garden, I could make a scratch pumpkin pie. Just as soon as I figure out how to make Crisco from scratch. I'm not stupid about money. Among other things, I did a lot a stints as a temp in banks. Which sounds superficial, except one of those stints included nine months as the residential mortgage customer service person. I was the person you called if you had a question about your mortgage. If you wanted to know if we had received your payment. If you wanted to know how to get your late spouse's name off your mortgage because they were dead and you wanted to remarry and it felt weird. If you were in foreclosure and you wanted to know what happens next. When I'm on the road, I read The Wall Street Journal. No cover to cover, but still. But like most people I didn't understand what it was that Wall Street was doing that got us in such freakin' trouble. Venturesome pointed me to the This American Life broadcast The Giant Pool of Money. It's fascinating. It brings a lot of clarity to a complex issue. You don't have to know anything about the stock market or really anything about mortgages. It's nice to know. This American Life has always been one of the coolest things ever. And this is one of the coolest things they've ever done.